As a best practice, you should confirm that your Relativity instance is functioning properly after an initial installation or an upgrade. 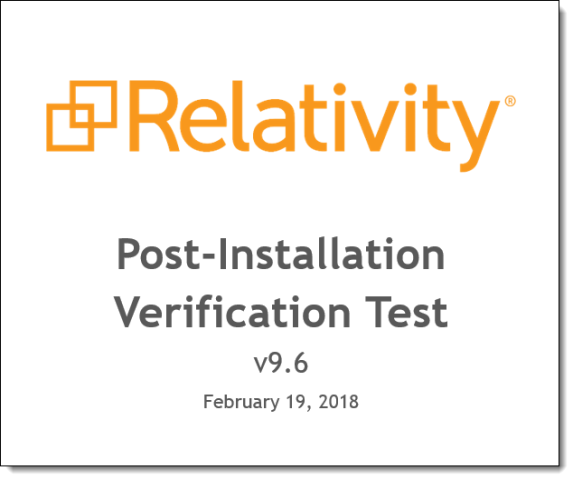 We provide step-by-step instructions and post-installation verification data for performing a post-installation verification test in your Relativity environment. The verification test outlines common tasks that you need to perform, such as creating workspaces, working with the viewer, and importing data. To obtain the testing instructions and data, download the Post-Installation Verification Test document. This document assumes that you are using the latest version of the Starter Template. If you aren't, your tabs, fields and other Relativity objects may not match those found in the test document. Likewise, the images found in this document may not match your Relativity environment exactly. You can choose to either complete all the steps in the document from beginning to end, or pick and choose the tasks you need to complete for your Relativity environment. Note: You can customize this Word document with additional testing scenarios tailored to your environment. Download the Post-Installation Verification Test Data.zip to download a sample data set that you can use to complete the verification test.